Abstract base class, which describes integrators capable of computing samples of the scene's radiance function. NetworkedObject implementation: When a parallel rendering process starts, the integrator is given the opportunity to attach globally shared resources to the process. This is useful for distributing heavy data structures (e.g. photon maps) without having to re-transmit them every time an image is rendered. This can be called asynchronously to cancel a running render job. In this case, render() will quit with a return value of false. Estimate the irradiance at a given surface point. The default implementation simply samples the hemisphere using cosine-weighted sampling and a configurable number of rays. An integrator such as irradiance caching will provide something smarter. medium Const pointer to the medium that encloses the ray (its.p, its.shFrame.n). A value of NULL corresponds to vacuum. includeIndirect Include indirect illumination in the estimate? Sample the incident radiance along a ray. Also requires a radiance query record, which makes this request more precise. Perform the main rendering task. The work is automatically parallelized to multiple cores and remote machines. The default implementation uniformly generates samples on the sensor aperture and image plane as specified by the used sampler. The average of the estimated radiance along the associated rays in a pixel region is then taken as an approximation of that pixel's radiance value. For adaptive strategies, have a look at the adaptive plugin, which is an extension of this class. This method does the main work of render() and runs in parallel for a series of image blocks, which are being processed at a time. 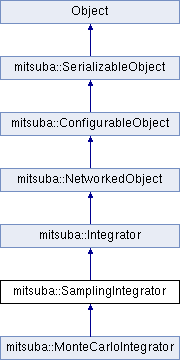 Serialize this integrator to a binary data stream. NetworkedObject implementation: Called once just before this integrator instance is asked to process an image block. In comparison to preprocess() this will be executed on every instance of this class, which is useful for connecting to globally shared resources (photon maps, irradiance caches, ..) after having been unserialized on a remote machine. A list of resources bound to the associated parallel process is given as a parameter. Used to temporarily cache a parallel process while it is in operation.